I read this article and found it very interesting, thought it might be something for you. The article is called How to Turn off, Disable Touch Screen in Windows 10 Tablet, Laptop, PCand is located athttp://innov8tiv.com/turn-off-disable-touch-screen-windows-10-tablet-laptop-pc/. A lot of PCs and tablets now support Windows 10 touch screen feature. It’s just amazing to use a touch screen in Windows 10 to navigate through apps and programs and do day to day tasks on your device. But sometimes users want to disable or turn off Windows 10 touch screen feature. For example, whenever I have to give my computer to my little niece, I turn off the touch screen because she could cause a havoc by touching the device randomly. If you want to turn off or disable touch on Windows 10 laptop, PC or a tablet, here is how to do that. Right click on My Computer or ‘This PC’ and click on ‘Device Manager’ from the left options pane. You can also reach Device Manager by a number of ways, including the search bar in Windows 10. This area also shows how many touch screen devices does your system support. 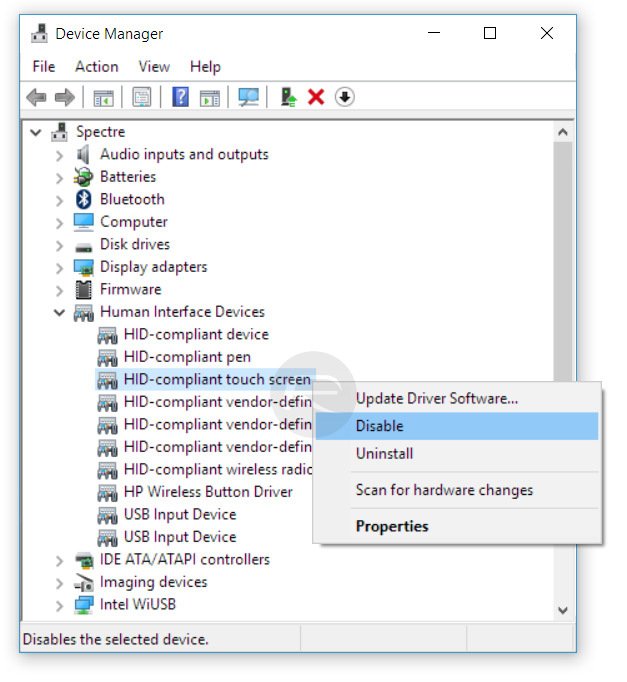 In the device manager, you will find an option named Human Interface Devices. This will be a drop-down option, which contains more options. If your device supports touch screen, you will see a sub-option under the HCI devices option which will have a title ‘HID Compliant Touch Screen’. You should right click on this option and that will bring up a context menu of even more options. In these options, you will see a ‘Disable’ option as shown in the photo below. When you click on disable, you will see a Windows popup which will warn and ask for confirmation. Just confirm this and Windows 10 touch screen will be turned off. If you change your mind later, you can follow this process and choose the ‘Enable’ option in the last step. This was how to disable or turn off touch screen in Windows 10 PC, tablet or laptop. If you have more questions regarding this or any other tech topic, feel free to comment on this post.